As the US space agency's Mars Reconnaissance Orbiter approaches the Red Planet, the BBC News website finds out why this mission will be different. What is the Mars Reconnaissance Orbiter (MRO) going to do? The spacecraft will study Mars' atmosphere, surface features and underground geological structure. Mission scientists hope to learn more about the history and distribution of water on the Red Planet. MRO will also look around for suitable landing sites for future manned missions to Mars planned as part of President Bush's vision for space exploration, announced in 2004. In addition, the spacecraft might be able to locate the remains of previous probes, such as the British-built Beagle 2 probe, which was lost in 2003, and the US Mars Polar Lander, which disappeared in 1999. 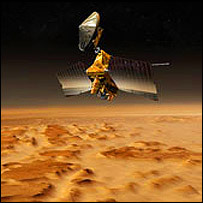 The orbiter reached Mars in March 2006. When it got close to the planet, it performed a manoeuvre called aerobraking, a technique which uses the friction of the Martian atmosphere to slow the spacecraft down. For the mission's 25-month primary science phase, beginning in November 2006, MRO will orbit Mars from an average altitude of about 306km (190 miles) - more than 20% closer than the average for any of the three operational Mars orbiters. The lower orbit adds to the ability to see Mars as it has never been seen before. Is it necessary to send yet another probe to Mars? Past missions have told us a lot about our Solar System neighbour, but MRO will scrutinise the planet in unprecedented detail. One major objective of the mission is to search for evidence of water. Understanding the presence and history of water on Mars is important because, without water, life cannot begin. By looking for water, researchers are in fact looking for the possibility that life once - or still does - exist on the planet. Another major objective that sets this mission apart is that it will be scouting out the Martian landscape, assessing its suitability for future human visits. What equipment is the spacecraft carrying? MRO's six science experiments will allow scientists to probe the atmosphere, surface and sub-surface of Mars to characterise the planet and how it has changed over time. HiRISE (High Resolution Imaging Science Experiment), one of three cameras carried on board, is the largest-diameter telescopic camera ever sent to another world. It will provide the clearest images ever taken of the planet from space, able to see objects up to a foot across and able to reveal rock layers as small as the width of an office desk, Nasa has said. The spacecraft is also carrying a spectrometer called Crism (Compact Reconnaissance Imaging Spectrometer for Mars) for identifying water-related minerals. A ground-penetrating radar called Sharad (Shallow Radar), supplied by the Italian Space Agency (Asi), will peer beneath the surface for ice and, if present, liquid water. The Mars Climate Sounder (MCS) radiometer will monitor the atmosphere, looking at dust, water vapour and temperature. Are humans really going to be sent to Mars? It might seem like the stuff of science fiction, but in January 2004 US President George Bush announced plans to send Americans to Mars. However such a mission is not expected to take place for at least 20 years. Nonetheless, any planned expedition to the Red Planet would need to take account of all the potential landing sites on Mars' rocky and hostile surface. Therefore the orbiter's ability to map the surface in fine detail will be the first step towards achieving this goal.